The Stand Model C8 Renaissance unifies the advantages of a one-point-source with the broadband fidelity of the SASB Technology. The result is a perfect impulse performance: Homogeneity, extremely low and deep bass, and holographic spaciousness leave other systems behind. The conception of C8 Renaissance utilizes a switch-able back-firing TOS-Unit. This unit optimises spectral inhomogeneous decay times: The system offers two complementary modes of operation: a hemisphere mode and a dipole-mode. With these features C8 Renaissance realises a wider scope of applications than other systems. The reproduction is outstanding in any case. Authentic music reproduction and three dimensional spaciousness due to perfect impulse response. Extremely fast and deep bass reproduction with high dynamic due to patented SASB Technology. Efficient cutt-off with high phase neutrality due to complex filter design. A Hemisphere: One-Pint-Source with homogenous hemisphere diversity. The combination of SASB, driver geomerty and filter design realizes the coherent wavefront of the C8 Renaissance. A fidelity just not achievable by other designs. 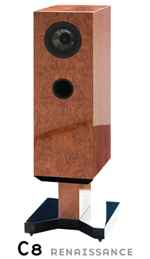 The unique features of C8 Renaissance is the combination of the broadband dynamics of mature full range systems with the coherency of electrostatic systems.